When working on my website I came across this neat WordPress Github profile plugin by James Valentine. It’s a simple but clear widget which displays Github user information. 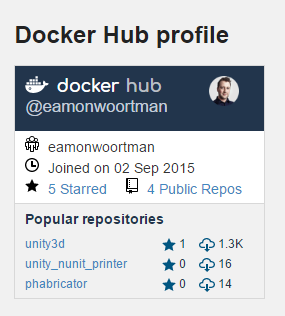 Having a couple of Docker Hub repositories of my own, I decided to create a similar widget for Docker Hub users. So I forked the Jame’s Github Profile Widget plugin and started changing API calls and ultimately changing the style of the widget. This resulted in the Docker Hub Profile widget. Credits goes to James Valentine for creating the original Github Profile Widget. I merely changed the API calls and visuals of his plugin so go to his repository and star him. Docker, Inc is the exclusive owner of the trademarks DOCKER, Docker Whale Design, Dockerfile, Docker Swarm, Dockerize It and any other word, phrase, image, or other designation that identifies the source or origin of any of Docker’s products (collectively referred to herein as the “Docker Marks”). To protect its trademark rights, Docker, Inc is required to control the use of its marks by others and the quality of the services with which they are used by permission. Therefore, Docker is willing to permit selected parties to make limited use of the Docker Marks only in accordance with these Guidelines. By using the Docker Marks as permitted below, you agree to follow these usage guidelines, The Trademark Guidelines, our Terms of service and all Docker’s rules and policies. These guidelines, rules and policies only apply to your nominative use of the Docker Marks to refer to products or services that come from Docker, and Docker is not granting you any license to use the Docker Marks, in the legal sense of “use,” in connection with the promotion of your own goods or services. Docker reserves the right to cancel, modify, or change the permission in this policy at any time at its sole discretion, or to terminate or revoke any license that is implied or inadvertently granted by these guidelines, rules and policies. For further information about the use of the Docker name and trademarks, please contact legal at docker.com.